No matter how carefully you’ve checked your Facebook privacy settings, it can still be an eye-opener to see how your Timeline (a.k.a. 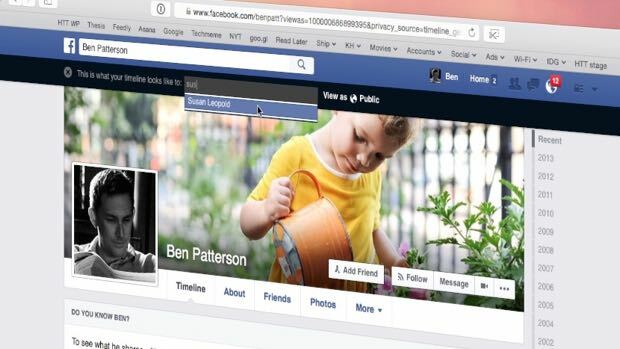 your Facebook public profile) looks to everyone else—to friends and strangers alike. Facebook’s “View As” feature not only lets you see how the world sees your timeline, it can also show you how your timeline looks through the eyes of a specific friend. Click the three-dot button and select “View As” to see your timeline as others see it. It’s a handy way to see, for example, whether your updates, photo albums, and friends are viewable by complete strangers—or, say, a Facebook frenemy on your “Restricted” list. Go to your Facebook public profile by clicking your name in the top-right corner of any Facebook page. Next, click the little three-dot button in the bottom-right corner of your “cover” photo, then select “View As” from the drop-down menu. You should now see your timeline as most people on Facebook see it—that is, anyone on Facebook who isn’t your friend. See anything public info that you’d rather keep private? 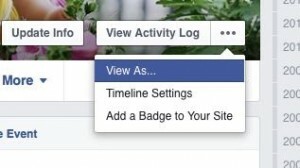 If so, you can change the privacy settings for any post by clicking the icon right next to the date. You may also want to go back to your privacy settings (click the padlock icon in the top-right corner of the page, then select Privacy Checkup) and start tweaking. Want to see your timeline as a specific friend sees it? From the “View As” version of your timeline, click the “View as Specific Person” link in the black strip along the top of the page, then type the name of one of your Facebook friends. Again, take a close look to see if a given friend can see anything on your timeline they shouldn’t. All done? Click the little “x” in the black strip to return to the standard timeline view.